We've long known that the power of digital marketing is in its measurability. But measurability is only half the battle. The other half is attribution — understanding how to allocate credit to your various marketing programs and appropriately recognize their impact on the customer journey. Over the past two years, we’ve built a strong foundation in attribution with Multi-Channel Funnels and the Attribution Model Comparison Tool in Google Analytics (as well as additional tools for AdWords and Google Display Network). Today, we’re expanding our attribution capabilities with Data-Driven Attribution in Google Analytics Premium, with algorithmic models and a new set of reports designed to take the guesswork out of attribution. It’s available globally to all Google Analytics Premium customers. Data-Driven Attribution analyzes the customer journey, whether that journey ends in a purchase (or conversion) or not. Our modeling methodology, grounded in statistics and economic principles, automatically assigns values to your marketing touchpoints. You’ll see a more complete and actionable view of which digital channels and keywords are performing best, so you can achieve a better return on your marketing and advertising investments. Recently, a large telecommunications company used Data-Driven Attribution to help optimize media spend and placements to help capture small business leads. After using Data-Driven Attribution, they gained newfound confidence in making decisions about Display. They saw leads from Display increased 10% while cost per lead remained flat, and saw that some media placements had been undervalued by 58%. Algorithmic: The model automatically distributes credit across marketing channels. You define your own success metrics, like e-commerce transactions or other goals, and the model adapts and regularly refreshes using the most recent conversion path data. Transparent: With our unique Model Explorer, you’ll have full insight into model behavior and understand how marketing touch points are valued — no “black box” methodology. Support: Google Analytics Premium customers can take advantage of their relationship with a dedicated services and support team. Cross-platform Integrations: In addition to our deep integrations with Google products such as AdWords, the Google Display Network, and YouTube, you can pull in data from virtually any digital channel. 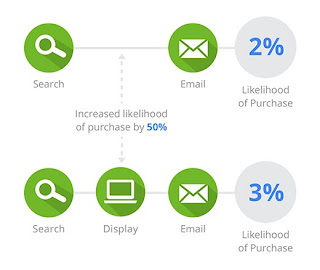 Google Analytics Premium customers can use the Data-Driven Attribution model to select and analyze marketing techniques, such as Display advertising or email campaigns. Easy analysis tools in the attribution reports let you compare values from the Data-Driven Attribution model to your default model, then sort and filter your data to discover where campaign changes could have the greatest impact. After identifying which channels (or campaigns, or keywords) have the greatest potential, adjust your programs and test the results. Once you’ve learned how the Data-Driven Attribution model compares to your prior model (and viewed the Model Explorer to see how the data-driven values were calculated), you can go straight to the ROI Analysis report, which lets you focus on optimization insights. The Data-Driven Attribution model is enabled through comparing conversion path structures and the associated likelihood of conversion given a certain order of events. The difference in path structure, and the associated difference in conversion probability, are the foundation for the algorithm which computes the channel weights. The more impact the presence of a certain marketing channel has on the conversion probability, the higher the weight of this channel in the attribution model. The underlying probability model has been shown to predict conversion significantly better than a last-click methodology. Data-Driven Attribution seeks to best represent the actual behavior of customers in the real world, but is an estimate that should be validated as much as possible using controlled experimentation. To learn more about Google Analytics Premium, contact your Google Account Manager, or visit google.com/analytics/premium.